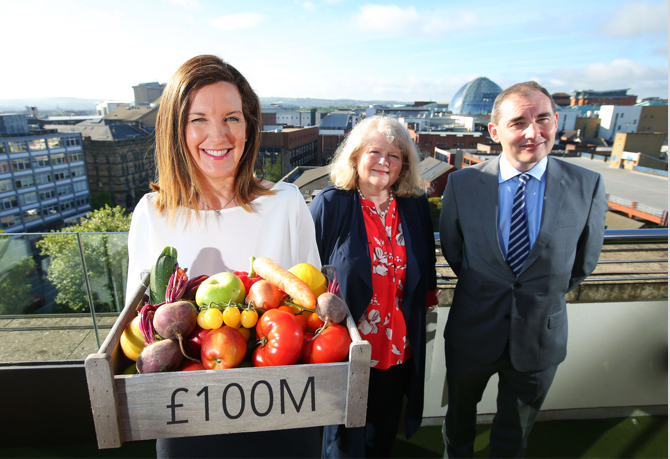 LEADING retailer Musgrave has announced a £100M commitment into the local food and drink industry this year as well as a £10M investment into its store network across Northern Ireland. This multi-million outlay is part of a province-wide campaign to demonstrate Musgrave’s commitment to the local community and industry across its SuperValu, Centra, MACE and MarketPlace brands. In 2017 Musgrave will buy more than £100M worth of local food and drink, working in partnership with over 140 local suppliers, selling more than 3,000 local products across its stores and working with over 3,000 local farmers. The company recently celebrated its 20th birthday in Northern Ireland and is a committed local employer of over 5,000 people across its business along with a dedicated partner of almost 130 retail families within the province. This year saw a £2M investment into health initiatives in the Centra brand with the Live Every Day campaign and SuperValu’s Let’s Cook mission. Musgrave has also committed £250,000 into staff development in 2017. Musgrave and its independent SuperValu and Centra retailers have invested significantly in Corporate Social Responsibility initiatives across the province, having raised a massive £2.5M for charity partner Action Cancer since 2005, believed to be the biggest single donation by a Northern Ireland company. Mace retailers and the MarketPlace brand have raised more than £60,000 for NI Chest Heart and Stroke, since beginning the charity partnership in 2016. “We pride ourselves on bringing great value and fresh food to the heart of local communities. Supporting retailers, local suppliers and communities remains a top priority for our business,” he continued. Our consumers know that when they shop with us, their money is invested back into their local community through wages, local sourcing, professional services and charitable contributions,” Michael added.